Stockton Heath Comedy. Thursday 30th June - I want a comedy night! Comedy returns to the Slug & Lettuce, Stockton Heath as part of the 2016 Stockton Heath Festival! Not only will you be treated to an excellent evening of live stand up but you will also be helping to raise funds for the festival and MacMillan Cancer Trust. Sheffield’s Tom Wrigglesworth is best known for his live storytelling shows and BBC Radio comedy programmes which take a comical and emotional look at family relationships. Alongside his comedy work, he’s used his engineering background to become a natural and engaging presenter for BBC Television and The Discovery Channel. 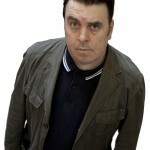 The show comes complete with one act to be confirmed and compere for the evening is Danny McLoughlin. Admission is £12 with advance tickets strongly advised. Show starts 8.30pm prompt. Very strong language. All acts subject to change. Over 18’s. Please Note We want all our customers to have a great night so we ask you to turn off your mobile and not to chat when the acts are on stage. Anyone deemed to be spoiling the enjoyment of others will be asked to leave without refund.